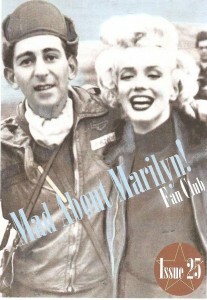 My review of Lawrence Schiller’s Marilyn & Me: A Memoir in Words and Photographs has been published in Issue 25 of the Mad About Marilyn fanzine, which also includes an in-depth profile of photographer Earl Thiesen and ‘I Dress for Men’, an article penned by Marilyn herself in 1953. Over at BitchFlicks today, a feminist perspective on Gentlemen Prefer Blondes from Myrna Waldron, as part of this week’s ‘Women and Gender in Musicals’ series. “The friendship between Lorelei Lee and Dorothy Shaw is one of the most positive female friendships depicted on film, and is one aspect of the adaptation distinctly improved from the original novella by Anita Loos…They’re a lot closer to ‘frenemies’ in the original, which is a surprisingly misogynistic depiction of women from a female writer. The musical version instead makes Lorelei and Dorothy inseparable. They are absolutely devoted to each other and protective of one another…Each thinks the other is foolish when it comes to relationships, but they accept each other’s differences and are loyal to each other before any other man in their lives. Another feminist aspect of the film, one which I think is left over from the characters’ original incarnations as flappers, is their complete sexual liberation…They drink, they smoke (though they are never seen actually smoking, just buying cigarettes), they dance, they party, they stay out late. And while wealthy men like Gus’ father look down on women like Lorelei, they are completely unapologetic about their choices. The film also depicts the women as unmistakably intelligent, albeit in different ways. Dorothy is very obviously meant to be the “smart” one, who corrects Lorelei’s mistakes, catches on to other people’s insinuations, and is always ready with a witty retort. But while Lorelei might be ‘book dumb,’ she’s not stupid. Together, Lorelei and Dorothy are master manipulators, and she’s far more devious than she lets on. Gentlemen Prefer Blondes will be screened at Chicago’s Gene Siskel Film Center today at 6pm, and also on Tuesday, October 2nd, with an introduction by film scholar Fred Camper, as part of an ongoing series, ‘American Cinema of the 1950s’. Nina Metz has reviewed this definitive musical comedy for the Chicago Tribune. 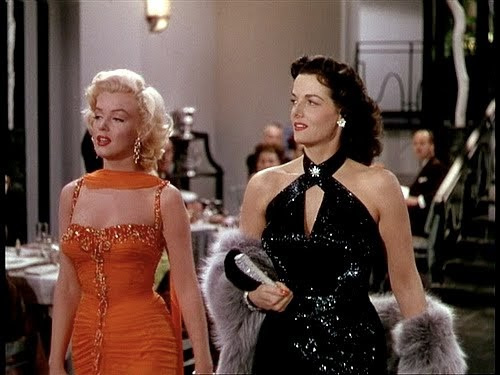 “A blatant critique of materialism wrapped up in an iridescent bow, Gentlemen Prefer Blondes indulges in Hollywood musical glitz while also offering some not-so-subtle commentary. On its face, the film wasn’t typically Howard Hawks’ style…The so-called Hawksian woman was your savvy tough-talker who could hold her own with the guys. That’s not exactly the setup in Blondes, but there’s no mistaking Russell’s nod to the Hawks archetype. She delivers her lines with a sharp self-possessed wit that stands in stark contrast to Monroe’s winningly dumb, cream puff of a performance. Submarine Entertainment has sold rights for Liz Garbus’s documentary, Love, Marilyn, to Australia and New Zealand, reports RealScreen. The new display, ‘Marilyn Monroe: A British Love Affair’, is set to open in London’s National Portrait Gallery this Saturday, September 29 (until March 24, 2013). Artinfo has posted a slideshow of some of the photographs to be featured. 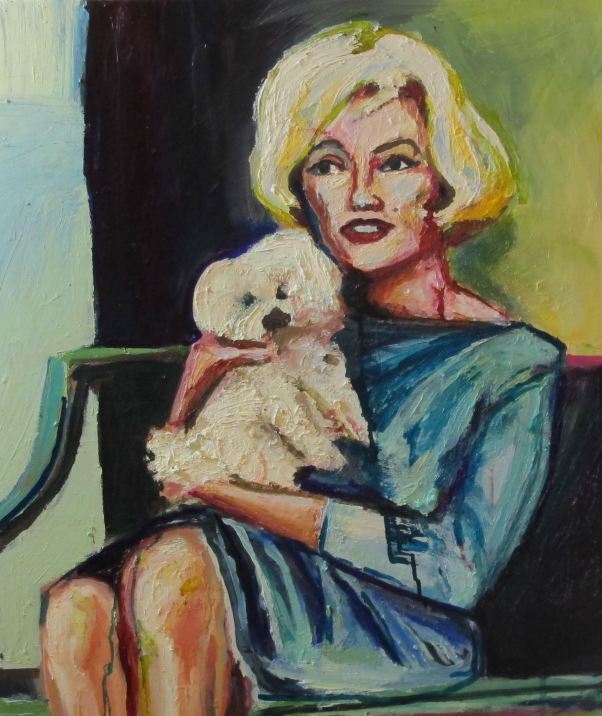 ‘Lucky Dog’, Liz Grammaticas’s latest Marilyn painting, is unveiled on her website today. 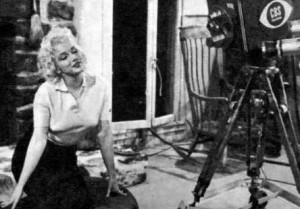 It is based on a photo of Marilyn and her adored pet, taken by Eric Skipsey in 1961. “With: F. Murray Abraham, Elizabeth Banks, Adrien Brody, Ellen Burstyn, Glenn Close, Hope Davis, Viola Davis, Jennifer Ehle, Ben Foster, Paul Giamatti, Jack Huston, Stephen Lang, Lindsay Lohan, Janet McTeer, Jeremy Piven, Oliver Platt, David Strathairn, Marisa Tomei, Lili Taylor, Uma Thurman, Evan Rachel Wood, Lois Banner, George Barris, Patricia Bosworth, Sarah Churchwell, Amy Greene, Molly Haskell, Jay Kanter, Richard Meryman, Thomas Schatz, Donald Spoto. Two unearthed boxes of diary entries, letters and whatnot (some of which were published in 2010 as Fragments: Poems, Intimate Notes, Letters by Marilyn Monroe) provide the novelty and appeal to what would otherwise be a standard life-overview. 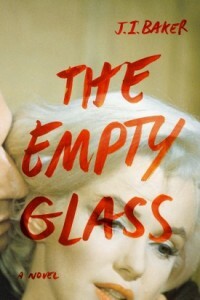 The erstwhile Norma Jean Baker’s awful childhood, her stormy marriages to Joe DiMaggio and Arthur Miller, the paralyzing effects of her insecurities on film shoots, her problematic alliance with the Actors Studio, her pill consumption, et al., all constitute familiar terrain that makes Love, Marilyn seem redundant at times. The first-person testimonies are more interesting, from archival clips of Susan Strasberg, John Huston, Joshua Logan, Jane Russell, Laurence Olivier and others to excerpts from memoirs and other writings by one of her many shrinks (read by F. Murray Abraham), Miller (David Strathairn), and analysts Gloria Steinem (Hope Davis) and Norman Mailer (Ben Foster), among others. Particularly flavorful are Oliver Platt and Paul Giamatti as Billy Wilder and George Cukor, respectively, both recalling their exasperation working with the hypersensitive box office sensation. 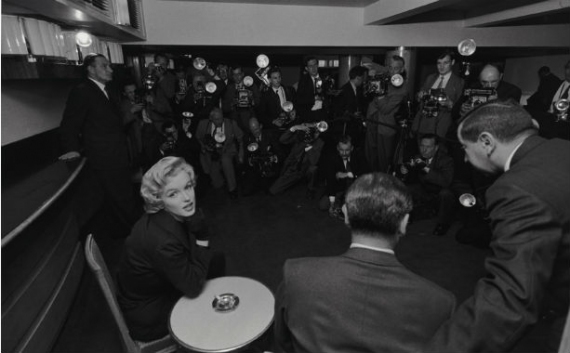 There are also present-tense interviews with biographers, critics, Actors Studio contemporary Ellen Burstyn, and close non-celebrity friend Amy Greene (who shares some salty thoughts on Marilyn’s husbands). While there’s no question Garbus has recruited first-rate talent to pay homage here, some of the most impressive names prove heavy-handed or simply miscast in attempting to channel the love goddess’s fragile spirit; moreover, having them act against green-screened archival materials has a tacky, pop-up televisual feel. Probably most effective in their straightforward readings are Jennifer Ehle, who gets a fair amount of screentime, and (perhaps surprisingly) Lindsay Lohan, who does not. Suffolk playwright Lorena Cenci has spoken about her new play, All About Marilyn – to be staged at the Jerwood DanceHouse, Ipswich, by 4th Wall Productions on October 2-6 – in an interview with the East Anglian Daily Times. “I realised that there had to be three different Marilyns – the young Norma Jeane, Zelda Zonk, the Marilyn we know from the screen, and the older, quieter Marilyn: the real Marilyn.